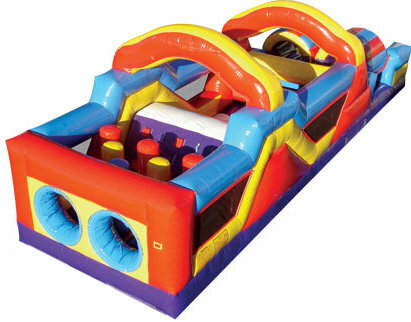 Our Challenger Obstacle Course Rental has bright colored obstacles that will challenge everyone. This obstacle course has a bright color theme, with see through netting on the side, so adults have a clear view of all the fun. You will have as much fun watching participants run through the maneuvering pop ups, climbing wall, and tunnel. Riders can run side by side challenging each other in a race. First one to the come through the end tunnel wins! Get ready to hear plenty of laughs and giggles with any of our obstacle courses. This obstacle course is the perfect size for a residence or at a public venue. We sell out every week - ORDER NOW!